Oh before I go on I just wanted to mention that YOU CAN GET BANILA CO FROM GMARKET NOW!! (I had to scream now - seller khs005492). One of my readers (beautystudent) left a comment telling me those great news! Anyway, I had no idea that I could order from Gmarket now so I relied on my usual Banila Co supplier (rumistyle on eBay) who offers me special discounts (I am a good customer hehe) so I didn't have to pay an arm and a leg to get my hands on 2 of the newest items from Banila Co's Gossip Girl collection. 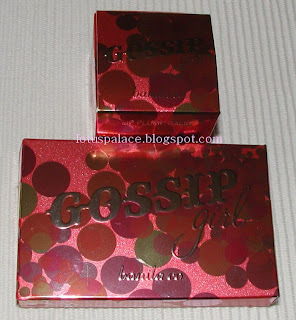 Overall the colors in the Gossip Girl collection are a bit too loud for my taste (bright pinks and oranges). However the new Gossip Girl Multi-Palette was a must as I am collecting all Banila Co palettes (this is the 4th now) and they're of excellent quality! 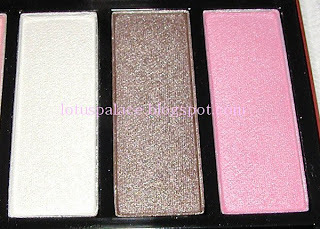 The colors in the palette are very wearable and feminine so I was happy to add it to my collection. 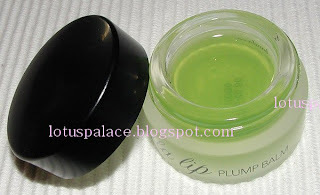 I also decided to try that new toxic green Lip Plum Balm so I added it to my order. 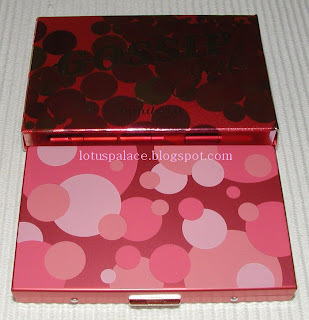 The case is really cute...it's made of metallic red metal (yep, sturdy metal case!) with little circles (or bubbles or whatever you want to call them) in different hues of pink printed on. Inside you'll find a nice little detail: The protective plastic sheet has red bubbles printed on so when I saw first pics and when I opened my palette it looked like there would be a red pattern printed on the shadows and blusher. 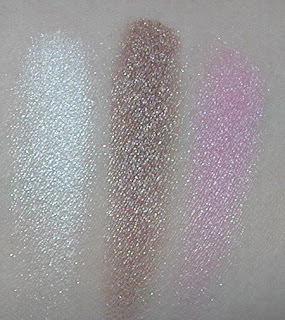 The shadows are silky and well pigmented with a pearly or slightly metallic finish. 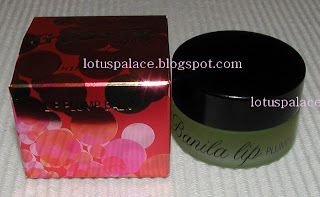 I think Banila Co came up with some of the best Korean cosmetics I ever tried. Only a few color makeup items didn't work for me so far! 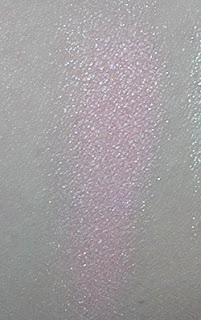 The colors are pure white, pink-toned taupe and hot pink. 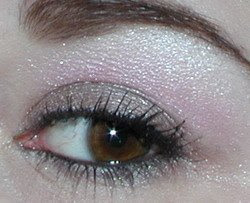 All colors create a really beautiful feminine eye look. The blusher looks rather pale and blah in the pan but when I applied it I just thought "wow!". It gives such a pretty glowy finish! 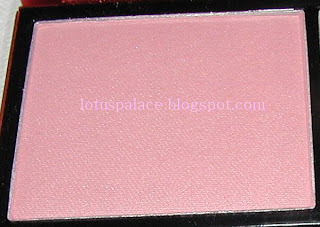 The blush is rather pigmented but light in color and works perfectly for me. It's a light neutral pink. I am not that much into lip plumping stuff as I don't really believe in the concept. In my opinion the best way to make your lips look fuller is still a mirror-shine gloss with a little shimmer. But I like the cool feeling some lip plumpers give and the new Lip Plump Balm looked pretty nice in its heavy frosted glass jar so I got it anyway. The lip plumper looks clear on my lips and has a strange gel-like texture/feeling. It's thick and lasts long but doesn't really give a very glossy finish. It has a pleasant fresh minty scent (there is some fruity smell in there, too!) and feels cool and soothing on my lips. I really like this stuff but I don't think this makes my lips look even a tiny bit fuller. Why oh why do I read your posts? 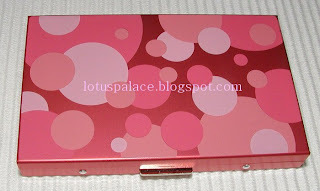 Now I am completely lemming that Gossip Girl palette! *Shakes fist at you* LOL. Thanks for the awesome post Kathi! It looks SOOOO pretty!! That palette is to die for~~ :D The colors are really nice. Haha, your lips are perfect anyway... you don't need any lip plumper! omg! those palette looks soo beautiful. I'm planning to go on gmarket and have a look and get a few bb creams (again!!) and a few extra on top. the won is soo deflated and I think it is a good time to buy. Oooh la la that palette looks so pretty! I love the playful colors, they look great for Spring! hey this palette is ver MAC like!!! but it's way cuter with all the dots! soooo beautiful. and i agree with fuz, you never need lip plumper! have you ordered from khs005492 on gmarket before? cause i have a hard time filling out the drop boxes since I don't know krn. Could you help me with that? Hi! The palette is pretty. And the case, oh, the case! So cute. I'm looking forward to your next Banila Co review. Btw,did Gmarket improve their services already? I hope they refund excess shipping charges to PayPal now. This blog is amazing. I love foreign beauty products. Now you have me searching GMarket for lip balms.. Grr.. lol. Ohh, your post came in time before I indulged in my gmarket order. I did received a tip on another shop selling banilla for the international crowd as well, but it did not have the palettes yet in its store. 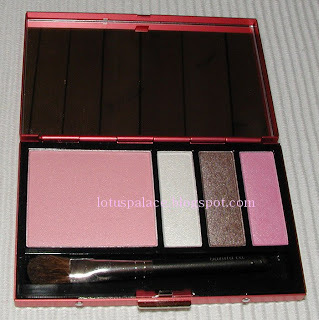 After I read the comment of beautystudent I went to check out the other shop, and YES, palettes. 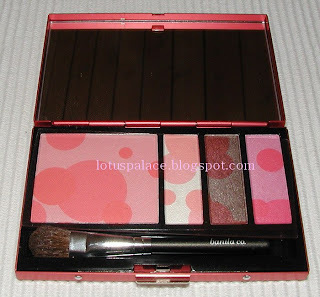 I was not sure to buy the Gossip palette, but your swatches made me buy this as well. It is truely gorgeous and I cannot wait for my new banilla haul to arrive! how come i cannot find banila co on gmarket?? i havent used it before.. can you send a direct link to that?? You are SO bad for me! Luckily (???? ), I'm having a lot of trouble registering for GMarket since I use a Mac, and GMarket's registration doesn't seem to like either Safari (expected) or Firefox (unexpected). Aaahh! Thanks for the GMarket tutorials, though! I just ignore the drop boxes and select none (except for the one for the color choice which is normally the first box). The drop boxes are to add stuff to your order like cotton pads, makeup wipes, brushes etc. nope, you get the refund to your Gaccount. I don't use paypal most of the time anyway as the exchange rate with my credit card is better. you have to either search for banilaco or for the seller name I posted. Just type either in the Gmarket search box and you'll find Banila Co stuff. Gmarket is PITA as they require IE and nothing else =( and even IE doesn't always run smoothly!